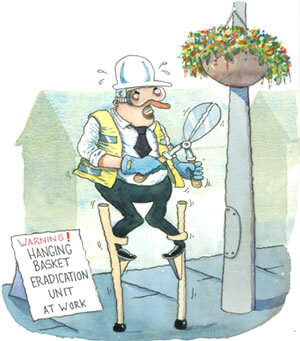 Back in 2004 a town did briefly take down its hanging baskets over fears that old lamp posts would collapse. This was an overly-cautious reaction to a low risk. However, after quick checks the hanging baskets were replaced and have been on lamp posts in the town every year since. Despite this, the story continues to be repeated and the danger is someone will believe it is a genuine requirement and follow suit. Help fight the myths - tell others about these pages!